It’s funny to think Victoria Beckham was once (ok still is) a Spice Girl and now has founded a very highly touted brand of clothing and accessories. Many other celebrities try to go the same route, and the majority don’t succeed; instead, they need to turn to large department stores to make mass produced items at an accessible price point. But Victoria went from being Posh, to being posh in her day-to-day life and style, to designing a brand that now shows during fashion week and has price tags that rival some of the industry’s finest. I’ve loved her bags from the beginning but both Amanda and I talk about the hefty price tags. While this would deter some, it seems to not impact Victoria; her brand continues to grow, and her handbags have been also growing in popularity. But for those of us who love her aesthetic but yearn for a better price tag, the Victoria Beckham Mini Satchel Shoulder Bag is just about the best you are going to get, coming in right under $1,600. Let me put this out there from the get-go, I know $1,600 is not cheap. But when most of her bags are over $3,000, relatively speaking this bag seems like a bit of a deal. Why is the price lower? Well, for starters it is a small shoulder bag. The design is compact, with measurements of 7″ x 6″ x 2″ and the price for the size is still high. But let’s move away from that and talk a bit about the bag. I like the design. I find the light-gray and black leather to work very well together as well as the adjustable shoulder strap. 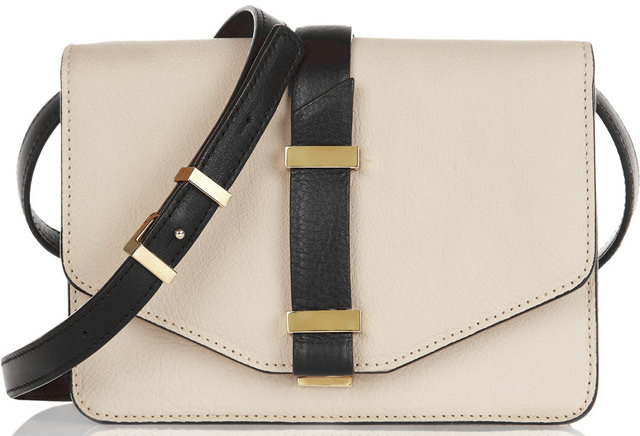 I really love the matte light gold hardware, it is a subtle way to play up the sophistication of the bag. The inside has a pouch pocket, but there won’t be much going into this bag other than your absolute necessities. The front flap is sleek and chic and the best finishing touch is the black waxed leather finish around all edges of the design. Price is $1,595 via Net-A-Porter.